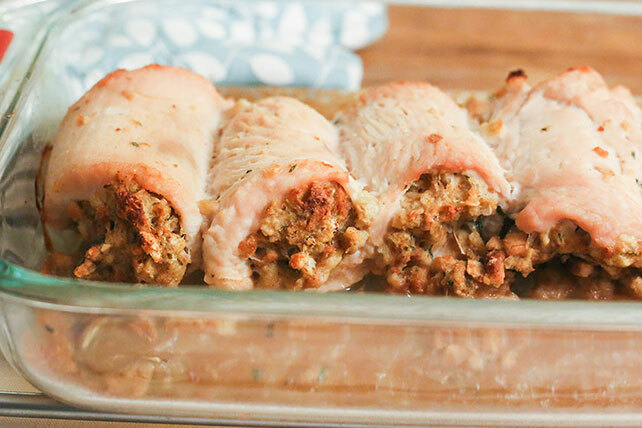 Turkey slices are rolled around sage-infused stuffing and baked in a baking dish. Like enchiladas—only without the tortillas. Preheat oven to 400°F. Combine stuffing mix and hot water in large bowl. Let stand 5 minutes. Stir in eggs. Spread stuffing mixture evenly onto turkey slices, to within 1/2 inch of outer edges. Roll up each turkey slice from one of the short ends to enclose the stuffing mixture. Place turkey rolls, seam sides down, in 13x9-inch baking dish. Pour gravy over turkey. Bake 30 minutes or until turkey is cooked through. Substitute 6 small boneless skinless chicken breasts, pounded to 1/4-inch-thickness, for the turkey breast slices. Add 1 pkg. (10 oz.) frozen chopped broccoli, thawed and drained, to the stuffing mixture.